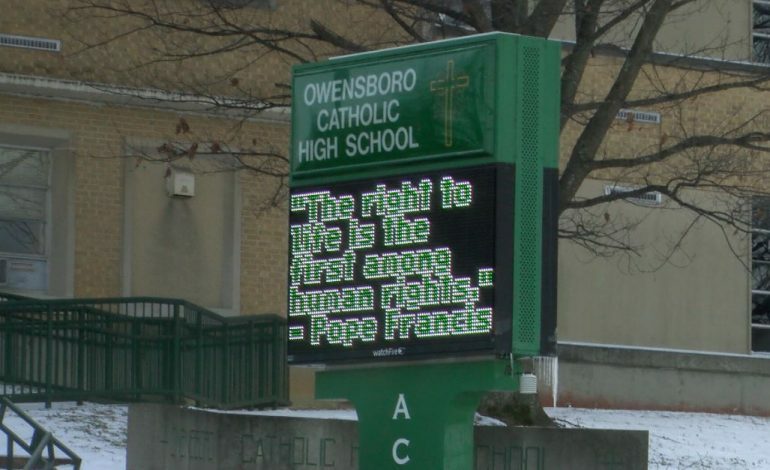 The Owensboro Catholic student replied by saying, “Land gets stolen throughout all of history…It’s how it works…It’s the way of the world,” and this reply was caught on camera. “I know someone who personally knows the student and he said the wrong thing at the wrong time. He has a huge heart and he’s a very nice person,” says Braydon Turner. Some people say since this exchange was caught on camera, an apology may be necessary. “Even if he doesn’t think he’s in the wrong, you have to take into consideration how other people may feel,” says Turner. Owensboro Catholic Schools President, Tom Lilly, confirmed this was not a school-sponsored trip for the high school students. Therefore, this particular student will continue to be an OCS student. Lilly released a statement to 44News saying, “There were some distressing events that occurred last weekend at the March for Life Demonstration in Washington, D.C. A Catholic High student reacted to a group of Native Americans at the rally. The student does understand the weight of his comment and has expressed remorse in how he handled and spoke in a heated situation. It was not his intent to inflict pain or to hurt anyone. As a Catholic Christian School, we are held to a higher level of accountability, as well we should be. By early Saturday afternoon, Owensboro Catholic had notified all teachers and staff that we would use these series of events to make them teaching moments in every classroom with age-appropriate lessons. The character of a person or organization is what happens after. We will find more ways to improve the caliber of discussion and reflect Catholic Christian responses.